Well, at the end of day one in this strange old venture, some tentative excitements out there. I've had a few solid offers... with a prevailing wind we might be a quarter of the way there already. Was rather chuffed to get a retweet from Neil McCormick. The Telegraph music journo is something of a hero of mine - he wrote the book Killing Bono about his disastrous band experiences growing up as classmates of Bono, The Edge, Adam Clayton and Larry Mullen Jr. Shook Up! never quite reached the same level of commercial success as U2, with Lady Luck consistently giving them a good (and consistently inventive) kicking at every turn. As such, it's required and hugely entertaining reading for all those like me whose bands never quite made it - at least, unlike Neil, our own rivals didn't go on to be The Biggest Band In The World (whose members all come over as thoroughly decent chaps one and all incidentally). Reading Killing Bono last year probably sowed the seeds of Lost Songs in my subconscious. It's like getting a warm hug to realise that there's others who've gone before you and failed probably even more spectacularly than you did. Mind you, it helps anyway knowing that just as Neil found his own niche in a slightly different if related career, I did too. But I identified with the sheer passion of it all - Neil was always driven by a belief that their stuff was good. It's fun to laugh at terrible songs I guess, but it's much more poignant if the songs were actually decent. 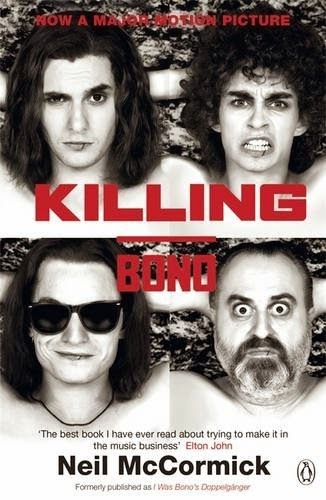 (Incidentally, the film adaptation of Killing Bono sadly lacked the authenticity of the book, inventing silly gangster subplots and contrived rivalries to get it into a more conventional structure. Shame they couldn't find a way to have told the true story - stick to the book). So anyway, cheers for the retweet Neil, and who knows - if I beg and plead enough maybe Shook Up! might feature in the Lost Songs video too. They're the most famous non-famous band out there. What is a lost song, exactly?